Unlike other garden vegetables, potatoes aren't planted from seed. Instead they are grown from small pieces of a mature potato that are referred to as seed potatoes. 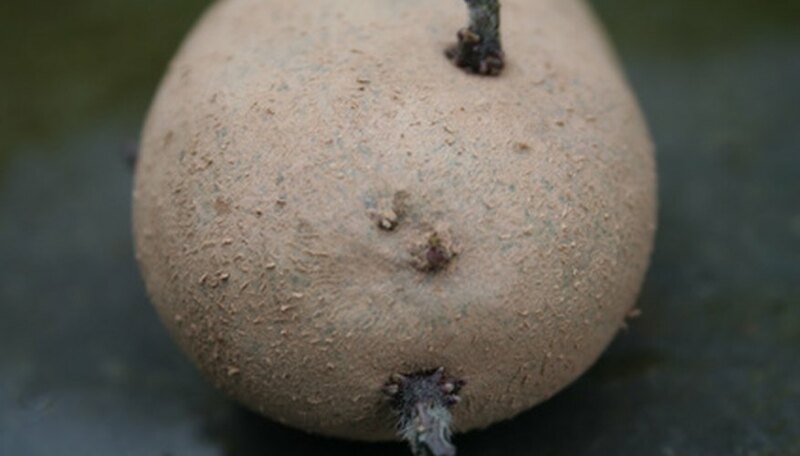 A seed potato has several growing buds on it that are called eyes. Each of these eyes has the ability to become its own potato plant. Plant small seed potatoes with just two or three eyes whole, or divide up larger potatoes with many eyes into several potato plants. Prepare a well-drained, full-sun garden bed two to four weeks before the last spring frost in your area. Lay a 2- to 3-inch layer of compost over the entire planting bed and till it in to a 10-inch depth. This adds nutrients to the soil while also improving drainage. Cut larger seed potatoes into 1- to 2-inch cubes, leaving at least one growing eye on each piece. Spread these out on a paper towel with the cut sides facing up for 24 hours prior to planting. This allows the cuts to seal over and makes the seed pieces less prone to rotting. Plant the seed piece or whole, small seed potatoes 1 to 3 inches deep. Space each seed piece 1 foot apart in the row and space rows 2 to 3 feet apart. Water the bed immediately after planting so it is moist but not soggy. Hill the potatoes once the plants begin growing. Pull soil from between the rows toward the plant with a hoe, gradually building up a 4- to 6-inch high hill around the stem of the potato plants over the course of three to four weeks. This helps shade the roots and protects potatoes that are forming near the soil surface from the sun. Lay a 2-inch layer of straw or bark mulch over the bed once hilling is complete. Mulch preserves soil moisture and prevents weeds. Water once a week, providing approximately 1 inch of water at each irrigation. Water more often during hot, dry weather if the soil begins to feel dry. While potatoes are generally a cool-season vegetable, there are late varieties that can be planted in mid-summer. Some seed suppliers sell just the potato eyes, unattached to a seed potato. These often fail to produce a mature plant.